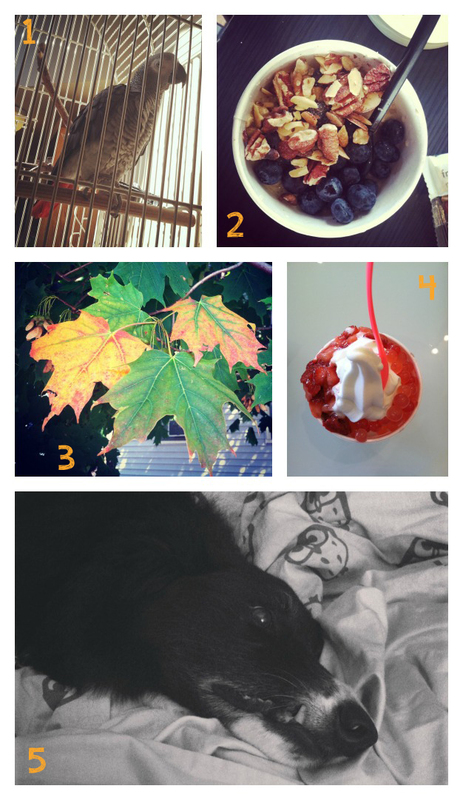 Posts in:September 2013 | Life. Realized. You have to eat oatmeal or you'll dry up. Anybody knows that. I'm an oatmeal gal and always have been. Not the packet kind. Oh no. I crave real, sticks to your ribs oatmeal. I have a few go-to favorites like peanut butter and jelly or the always tasty brown sugar, walnuts and cinnamon combo. Sometimes it's a clean out the baking cabinet kind of day and includes a hodge podge of ingredients like craisins, coconut flakes, and maple syrup. We've had a can of pumpkin puree loitering in the pantry since last November, and I've been toying with the idea of pumpkin pie oatmeal. This morning I took to the internet and made it happen. At first I doubled the original recipe (which made one serving) for the hubs and I. When Kiddo showed interest, I doubled it again. If Mister Picky liked it, I didn't want to risk having too little to fill his belly. It was good. Jared and Mario both gave approving mmmms and cleaned their bowls. Mario declared it to be the best oatmeal he'd ever had and that it tastes like dessert for breakfast. I guess this one's a keeper. Combine all ingredients in a sauce pan and cook on medium heat until desired thickness, stirring regularly (the microwave would probably work as well). Divide into bowls and sprinkle with cinnamon, chopped nuts, brown sugar, and any other toppings that strike your fancy (we used these three). I definitely made this recipe my own, and so should you (again, it's adapted from this recipe). It was filling and oh so delicious. I love when something so delicious comes together... and only requires things I have on hand. Our weekend is off to a good start! A tetanus shot and two trips to McDonald's. Today Jenni's Blogtember prompt is "a post written from a coffee shop". It just so happens I am in one as we speak. Drinking a maple latte. Trying to figure out how to navigate the A button on my keyboard. You see, last night was a busy one. Kiddo had dodgeball and, post playtime, took an excruciatingly long shower. Seriously, dude? His marathon shower sessions are time I will never get back. Oy. Anywho, post-shower his dogeball instructor invited him to climb the rock wall a couple times. Needless to say, we were late getting home. I was throwing together some leftover spaghetti and meatballs for Kiddo's dinner and, in the process of trying to shake the remaining sauce from the jar, tapped it on the bowl. The jar neck shattered in my hand and I instantly knew I was in for it. You know those moments when you cut yourself and don't want to look? That was me. If you don't look it won't be that bad, right? Well, this particular nick wasn't going to be remedied by a Spongebob Band-Aid. And thus our emergency room adventure was born. On the way to the ER I stopped at McDonald's to feed Kiddo... at this point it was way past his dinner time. We haven't been to a fast food joint in about a year, so I thought he'd be thrilled. I was informed that he was on a hunger strike until my finger was no longer gaping. A Batman toy currently offered in the Happy Meal changed his mind and a meager 4 nuggets were consumed. But not a morsel more, said he. After a rather lengthy wait, the doctor came in, leaned against the sink and said, "How would you like me to treat it? It's up to you." Really? If that's the way it works, I'm going to call myself doctor and set up shop in an RV behind Starbucks. I decided to have it glued shut, as opposed to stitches which would need to be removed by a professional in a week's time. And by professional I mean my husband and a pair of nail clippers. I was wrapped up and sent on my way. It was late and we were tired and hungry. So we stopped by the same McDonald's on our way home. Before you judge, know that we live in a rural area and it was the only establishment serving food between the hospital and our home at that hour. Jared's hunger strike had come to a close. Apparently the Batman toy was a bust, and he now had his eye on the witch toy from The Wizard of Oz. "Just tell them I'm a girl this time". As luck would have it, he got his witch. "This really is a happy meal, Mom." I had just finished the chapter on gratitude in The Happiness Project earlier that afternoon. While I don't think a gratitude journal is in my future, I have resolved to 1. look at the bright side, and 2. act the way I want to feel. Last night's incident is the perfect opportunity to practice seeing the silver lining. 1. I am grateful I grabbed a red towel to stop the bleeding. It's the only red one we own, so the odds were pretty low. The idea of having blood stained linens around the house is generally frowned upon, especially in the kitchen, so I won't have to throw it away. No need to budget for a replacement. 2. I scored a tetanus shot; my first in over 10 years. I was more concerned about getting Lockjaw than reattaching my finger anyway. As a parting well wish, the doctor proclaimed I would also be safe from Whooping Cough. I felt so much better, as you can imagine. I hadn't anticipated catching that from a finger laceration. 3. Scars are a rite of passage. They make one appear rugged and worldly. After a childhood spent on a cattle ranch, my husband has many scars to show for it. (Which is part of what makes him so ruggedly handsome, in my opinion. The ability to grow facial and chest hair is a close second.) I have one on my chin from a pool accident at the age of 6. (The first and last time I needed stitches.) It's a very white collar injury, seeing as we were in a community pool paid for by housing association fees. Needless to say, it has never felt very legit. Now I can make it to round 2 of the I'll show you my battle scars if you show me yours game. 4. My final note of gratitude comes courtesy of Kiddo. "Look on the bright side, Mom. For the next few days you will look all fancy with your pinky in the air." You may call me Kate for the duration, if you please. An unintentional update courtesy of some strong coffee. 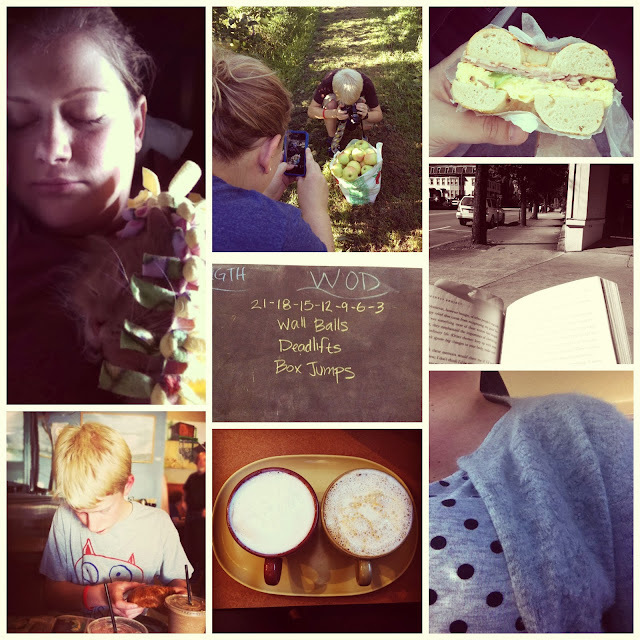 Despite a blogging respite over the last few days, I have little idea what to write about. I feel a certain pressure to produce something profound, but alas. I keep thinking I will be infused with inspiration once my coffee kicks in, but I've burned my tongue twice and am now convinced Starbucks brews their coffee at 1000 degrees. How can it still be so hot?! Git. In. Mah. Belleh. I should be studying for what will undoubtedly be a brutal exam next Monday. I considered writing a post about Biochemistry. Two birds. One stone. But if I have no desire to read about it, and my grad school acceptance depends on it, chances are good you don't want to hear about amino acids and functional groups, either. If so inclined, would you mind terribly to read the chapters and give me the CliffsNotes version? The truth is, these last couple months have been trying. They've tested my patience, my relationship(s), and sent ripples through my existence. I suppose we all need times like these to retain a healthy perspective, but I'm over it. I'm emotionally exhausted. I've let these trials worm their way into my psyche, infusing doubt and resentment. Most days I'm fine, but some leave me wanting to walk away. Total physical and emotional abandonment of what has me in a funk. On the path to less stress and a more effortless existence, Mario and I have begun a debt snowball system. I've mentioned this before, but the wheels are in motion. We sat down and wrote a budget. We definitely got the (snow)ball rolling, to the tune of several hundred dollars. On one credit card. We spent our entire paycheck on paper so there would be no frivolous spending. Bills got paid immediately so they would leave our checking account, and everyday money was sorted into envelopes. I had to actually enter the lobby of the bank and withdraw a large sum of cash for monthly expenses. It was weird. Gas, groceries, miscellaneous purchases, eating out, and "blow" money were sorted based on our predetermined budget for each. ("Blow" money is Dave Ramsey's term for cash that can be spent on whatever one chooses. My morning coffee will take up a lot of that. Mario and I both get an envelope of cash each month... and what we do with it is our business.) Budgeting is tricky, and I'm still figuring out the nuances of an envelope system. For instance, this morning I went to Target to grab some things. 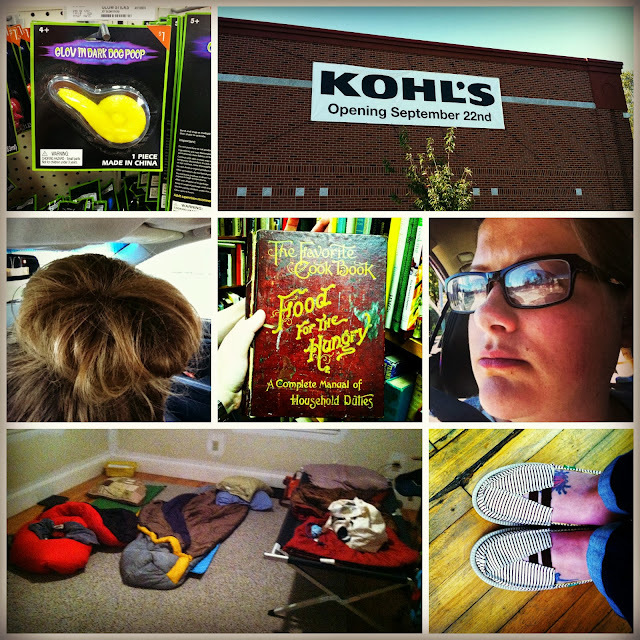 I bought household goods, food, and a sweater. One purchase, three envelopes. I don't carry all them with me, so I had to sort through the receipt and calculate how much to return or take from the various envelopes. But I paid with cash. No debit card. I know what I bought and was more selective with my purchases. I printed Target coupons before going and saved a good chunk of change. I like this system and the feeling of control and organization over our finances it offers; I'm sure with time it will become easier to navigate. Yesterday, after Kiddo asked for an expensive fresh-squeezed juice from the food co-op (which would have come from my blow money), I decided it would be awesome to get him in on the action. Because our house is officially on the market (as of last Friday), constant upkeep is necessary. We spend about 15 minutes every evening tidying up so that it doesn't feel overwhelming, and he's been a big help. I think he deserves his own blow money. At times I've wondered if Jared has been worried that all this money talk and house-selling activity indicates some sort of hardship. It doesn't, and I've tried to reiterate that we are doing this because we want to. Because we want to move next summer. Because anything that makes life easier and less stressful is a good thing. He is definitely old enough to join in and I can't think of a better way to teach him the benefits of being debt-free and saving for the things we want (and the future). It turns out I had a lot to say. As I mentioned before, we put our house on the market. After a lot of thought and discussion, we decided to go ahead and list it. Our realtor had some promising news (before it was, um, a lot less promising), so I'm choosing to be optimistic. You never know if there is someone out there looking for exactly what our house has to offer. We live about 25 minutes from town. Tuesdays and Wednesdays Kiddo has activities at the Y. On Tuesdays there is enough time between school and play to go home for a bit. The time gap is much smaller on Wednesdays. I have decided to be intentional with that time. Over the last several weeks, I pick Kiddo up from school and we spend quality time together... usually a visit to a local coffee shop to do homework and enjoy a treat. Yesterday I had him walk the short distance from his school to the town square. I sat on a bench with a clear view of his walk, read a book, then we caught up on each others day over cupcakes. I've never met a more beautiful creature than that boy. While the weather is nice, he will continue to walk down to that bench to meet me. One of Kiddo's favorite pastimes in the whole world is laser tag. There is a big arena about 90 minutes from our house, and when in the area we stop and let him play. He comes out soaked in sweat and grinning from ear to ear. While he plays, Mario and I do, too. 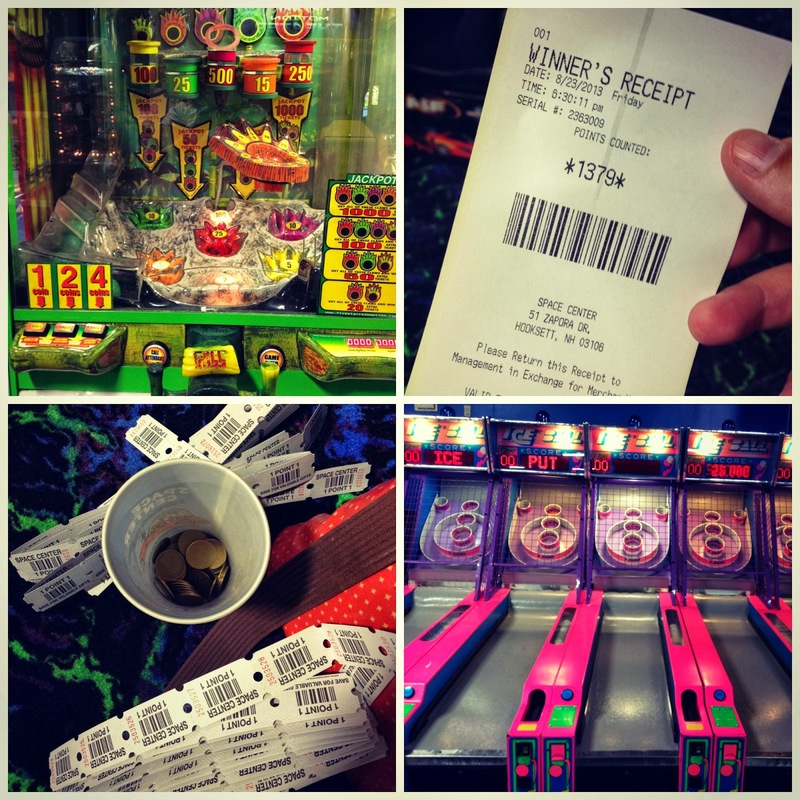 We buy a cup of tokens and play games. Finding our inner kiddo is so important. As a grownup, it's easy to forget to let loose once in a while. This particular visit I was on fire. The other morning Mario and I had a quick breakfast date before meeting with friends. This particular restaurant had the worst coffee. 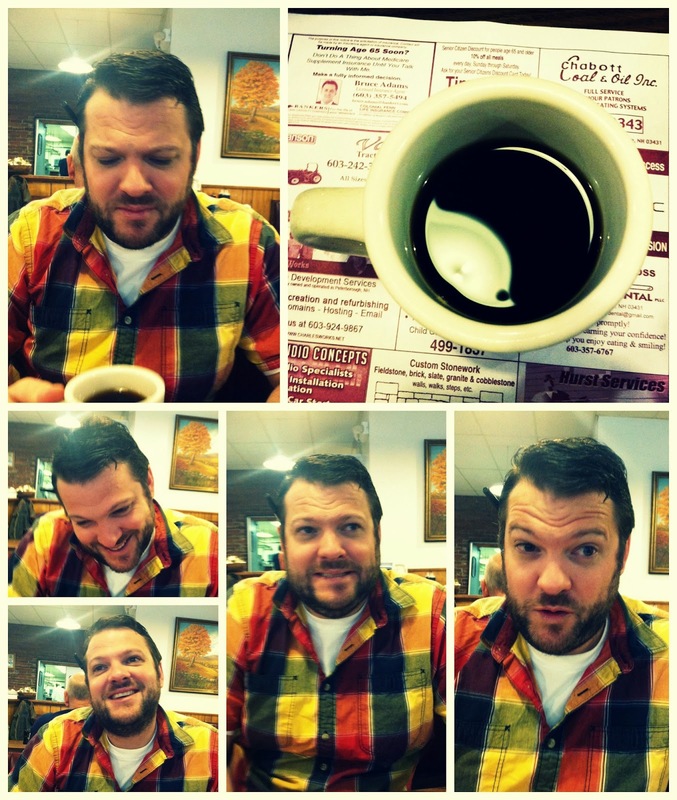 Have I mentioned how expressive my husband is? I snapped a few photos of his reaction to the brew's tar-like quality. We laughed. Hard. These moments remind me of why I committed to be with this dude forever and ever. I've always been a sucker for cute woodland creatures. 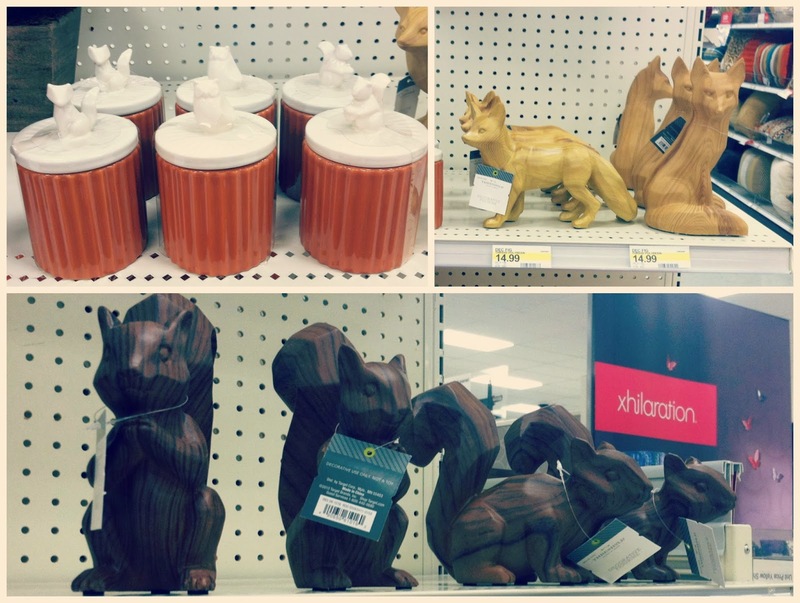 Target has a whole line of woodland-themed decor right now. I want all of it. Love, love, love. Perhaps a piece or two should make it into the October budget. Or onto my birthday list (October 10th in case you are feeling generous). It's officially fall. As told by the glow-in-the-dark poop on the Halloween rack at Target. What did they feed that animal?! // Kohl's is open! Silly? You try buying a kid's white button down shirt for a school program with only a Target and JC Penney in town. // I'm so studious. Actually, I'm plagued with eye allergies thanks to bursting maples everywhere I turn. My eyes are constantly irritated (and I scratched my eye recently, calling for prescription eye drops), so contacts are out of the question. It's taken some adjustment, but I like mixing up my look. // I saw this cookbook at an antique bookstore Kiddo and I visited last week. It was darling and made me smile. // I accidentally made a high bun. I know mastering "The Bun" is a requirement of being a blogger, but this girl is not so talented. I literally threw it into a knot to get ready for CrossFit and discovered that I'd done it! Perhaps I can do it again, with more intention. (See how optimistic that was?) // Kiddo's school has a yearly yard sale fundraiser. I helped set up then spent the night with a couple other moms to watch the stuff and so we could be ready at the crack of dawn. I had two (whoa!) mojitos at a place called Margaritas and spent a great evening with a couple of amazing ladies. // A pair of flats I have had for a while decided to attack my feet. There was blood and blistering. (Gross, but we've all been there.) I had several more hours before heading home, and could barely hobble, so I stopped by a local shop to find something to get me through the rest of the day. These Sanuk slip-ons were $10 marked down from $55. Score! I've been wearing them a lot while my feet heal. Last Friday started with CrossFit, then a day spent setting up the yard sale, running home to meet the realtor, and returning to spend the night. Saturday morning came waaay too early. When we got home that afternoon I crashed on the couch for a couple hours which is so unlike me (I'm a nap-phobe). My furry boyfriend slept on my chest the whole time. He's such a snuggle bug. Swoon. On a side note: we volunteered to provide cupcakes for the bake sale that goes on during the yard sale. Mario made them because I ran out of time, but he didn't have time to make frosting. We served them anyway and I let it go. Making leaps and bounds in this resolution! // Kiddo is a natural photographer. He has such a great eye. I came across my last camera and decided it should be his. I can't wait to see life through his eyes. // Too many carbs. Food regret. I need an intervention. // My perch from the bench while I wait for Kiddo, book in hand. // I think CrossFit is trying to kill me. Since I've been back, the WODs have been craaazy. In case you were wondering, this means the first round includes 21 reps of each move, then 18 of each and so on for a total of 84 reps of each move. Today was 100 burpees and 100 kettlebell swings in 12 minutes. It hurt. A lot. // I love this kid. Even after all this time, I could still just sit and watch him. // His and hers lattes. Mario spilled his across the table and down the front of me. It's not the first time he's poured a beverage on me and it probably won't be the last. That boy is all thumbs. I laughed. // It's officially cardigan weather. Happy girl, right here. My CrossFit journey began back in June. I had heard about it before, here and there, but my sneakers had yet to enter a "Box" prior to that day. I signed up for a month-long Foundations course to get my feet wet. Not all CrossFit studios offer such courses, but mine requires this intro prior to allowing people to take the regular classes. I get why. CrossFit is no joke and injuries can certainly result without proper instruction. It sucked. It was the hardest, most frustrating thing I've ever done physically. I wanted a shake up and, well, I got one. My hands were blistered, my knees were bruised, and sitting or standing felt impossible some weeks. But I did it. Week one I could barely hang from the bar. By week two I could not only hang on for longer periods, I had begun swinging from it. I took 3 regular classes the week prior to leaving for vacation... and managed my first "kip" on the last day. It felt good. For those who aren't familiar, I'll try and describe it. I think of CrossFit as a very back to basics workout. When first walking into the studio, I wondered what in the heck I was going to do (but could instantly tell it was going to be unpleasant). There are no machines. Instead, you use your own body or free weights. Lots of push ups, jumping on and off of things (like the boxes shown above), pull ups, running, and Olympic weight lifting moves. There are many acronyms to become familiar with and the moves come with quite a learning curve. During a given hour-long session there is a warmup, strength training, then the Workout of the Day (WOD). The WOD can be for total time, number of reps in a given time, etc. While the WODs don't typically last longer than 20 minutes, I feel as if I've worked out for hours. In most instances, total muscle fatigue occurs. 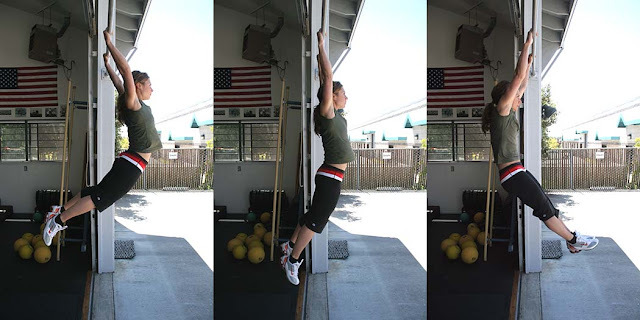 Fortunately, things are scaled depending on your athletic ability (although all levels are hard) and a system of resistance bands are used to aid in certain moves (pull ups, military push ups, etc.). Kiddo practicing his (assisted) pushup after class one day. When we got back from vacation I wanted to get right back into it. Unfortunately, my emails went unanswered and August nearly came and went. Over that time I decided CrossFit probably wasn't for me and began mentally writing it off. Then a note arrived in my inbox, along with the sincerest of apologies for not seeing my email. I was urged to come back. I attended the last Foundations class in August just to re-wet my feet. I loved it. Despite feeling nervous all day about the progress and strength I had undoubtedly lost, I did great. I could still hang from the bar (and swing a little). My time for the WOD was excellent. I felt a renewed interest. I notice results very quickly and am satisfyingly sore after every workout, proof that I'm working just about every muscle fiber in my body. I've never had that before. Not only is it good for me physically, I find a mental release that is unrivaled by most other workouts. Jogging on the treadmill for a half hour certainly centers me, but CrossFit requires utter and complete focus. There's no thinking about my to-do list or life's worries. I leave feeling calm and freed... and the feeling lasts. It's a perspective changer. Here's the rub: I'm not sure it's a sustainable workout for me, for a variety of reasons. Because it's class-based, and only offered certain times on certain days, full time work and a family will make it hard to maintain a 3+ class per week schedule in the future. The monthly cost of membership is high, so missing classes is not an option for me. I also worry that the incredible intensity of the workouts could lead to eventual burnout. Another thing I struggle with is the atmosphere. I'm a novice. I want to lose weight (as told through better-fitting pants) and feel strong. While I have a propensity to gain weight effortlessly, I am very muscular. My body tends to adapt to workouts quickly, and therefore plateaus easily. CrossFit is effective because it tackles my issues and plays on my strengths. It includes weight lifting and cardio in one hour-long session and I never worry about plateauing because the intensity is high and no two workouts are the same. I look forward to feeling improvement and seeing faster times on the board. I compete with myself with the end goal of health and happiness. However, CrossFit is intrinsically competitive. I avoid the evening classes because of this. They are more crowded and mostly full of athletes. There is chest-thumping, grunting, and the oh so nerve rattling drop of 100+ pound weighted bars on the concrete floor over and over again. That's not why I'm there, and am easily intimidated and turned off. When among a group of conditioned CrossFitters, it is also harder to get the attention of the instructors when I need help with a move or deciphering what an acronym means. I know they want beginners to feel welcome, but we often do not. One day I hope to be able to do unassisted pull ups. But that's not where I am now. Nor will I ever fit into the uber-competitive environment. This is a rather lengthy explanation of where I am at, right now, and what CrossFit looks like to a non-athlete. I was never the naturally athletic, sports-playing kind, even as a kid, and I struggle to stay with a fitness program. I need to reach regular milestones in order to maintain motivation. I want to lose a handful (or five) of chunk. So for now, while life permits, I'm sticking with it. I signed up for a one month (3 day/week) membership. I'm committed to giving this month all I've got. At the end, I'll reevaluate. Perhaps I will feel called to the new kickboxing studio in town. Perhaps I'll turn Kiddo's youth membership at the Y into a family membership and try some of their classes (of which there are dozens). Perhaps I'll decide that CrossFit is what I've been looking for all along. One of my favorite places on earth is Deception Pass, a bridge connecting Whidbey Island to Washington's mainland. As a child I used to look out the car window with both wonder and awe as we crossed. How did they manage such a feat? A steady stream of mist comes up off the water and over the bridge creating an eery beauty I've rarely seen rivaled. This summer I returned for the first time in about 20 years, and found myself feeling like that same amazed little girl. The fact that I haven't shared one of my favorite places pops up in my mind occasionally. 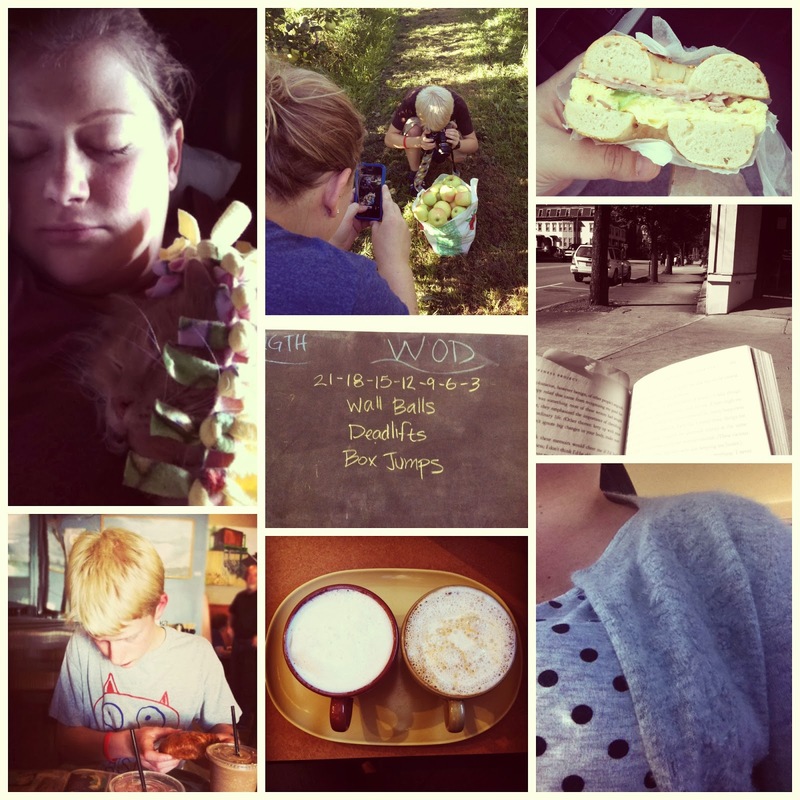 Jenni's Blogtember prompt today is "only photos"... and I can't think of a better way to reveal, through my own eyes, a place so dear to my heart. Happy Wednesday! 1. a feeling of listlessness and dissatisfaction arising from a lack of occupation or excitement. I have it. Which is not uncommon. If I'm ever lying around and proclaim "I have... " my husband quickly replies "ennui?". I don't use it because its status as a 50 cent word carries a certain pretentiousness. Nah. It merely sums up perfectly a condition I find myself afflicted with on a regular basis. I get bored and restless easily, I've learned. The point of all this? I have nary an idea what to write about today. I have several subjects in mind, but the ability to getting fingers to keyboard in an organized fashion eludes me. This morning I drove around for twenty minutes after dropping Kiddo off just to find a place to set up camp. To study. Here I sit at Starbucks, my chosen destination, with a few photos edited and 5 pages of my GRE prep manual read. I've got to get it together. I need to get organized. Thoughts, materials, time... all of it need some serious organization. This post could use some, too. So today I'm going to stop talking. I'm going to order a second caffeinated beverage. I'm going to buckle down and get some work done. I'm going to bust my bum at CrossFit. Sore muscles be damned. I'm going to stop wandering around like a leaf in a breeze, wishing I had established a schedule. A balance of work, study, home, and personal life. I'm getting there, but re-dedication to the cause is necessary. Here is a glimpse at our weekend. Although a weekly trip to the orchard is to be expected this time of year, I used the opportunity to play with previously undiscovered camera settings. Fact: I now want to miniaturize everything. and anyone else who can go a week without a drink. While we are still ironing out an after school schedule, things are feeling a bit more steady around here. We are ever so slowly finding our groove. Which is good, seeing as things are going to get more complicated in the coming weeks. I have yet to begin studying for the GRE, and must get started ASAP. Despite a lot of setbacks, and even more contemplation and advice-seeking, we have decided to put our house on the market anyway and will be meeting with the real estate agent next Friday to make it official. Which means the house must be tidy at all times and we may be asked to step out for a showing on a moment's notice. I'll do whatever is necessary. I just can't guarantee it will be with a smile on my face every time. Today I'm getting back to CrossFit. I have tried to get there no less than 3 times this week, but life had a way of foiling even my best laid plans. I am realizing that in order to get my money's worth out of a monthly membership (which I have avoided thus far), I must schedule it in and set it in stone. On Monday I also resume the research I conducted this last summer. I was hesitant to go back, seeing as a "real" job is much-needed, but I enjoy it, and it will look good on my PA program applications. Still, healthcare experience is always on my radar. 1// This dude sure wanted to be my buddy, and proceeded to follow me around the waiting room at the vet's office. I'm not one for domesticated birds, but he was a lovely little fellow. We were at the vet because my friend, Jack, nipped someone and his quarantine was up. The vet was not concerned, seeing as he is the loveliest of pups, and gave him a clean bill of health. He did say we should warn people to approach him slowly, as humans don't always respect an animal's personal space and could scare him again. The man he bit tracked us down this week and called to say he is fine and to make sure we (and Jack) were okay. I was so glad to get that bit of closure, as I have thought of that man many times over the past 10 days. 2// I've had one or two much-needed peaceful mornings. After dropping Kiddo off at school, I had a couple of small windows before appointments. 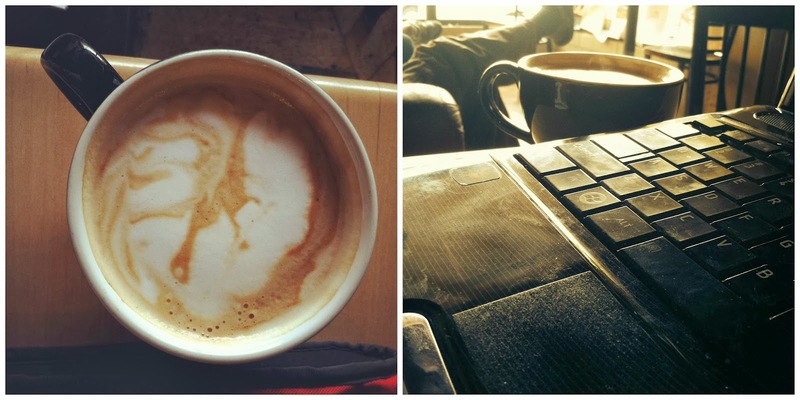 I used that time to sit at Starbucks (or my favorite local coffee shop), have a cup of joe and some breakfast, and blog or catch up on emails. 3// Seasons, they are a-changing. According to the leaves, anyway. It was almost 100 degrees on Wednesday and totally unpleasant. Don't tease, Mother Nature. 4// Kiddo and I beat the heat with some froyo. Oh, yeeeah. 5// Mr. Jack Sparrow is getting a lot of attention in this post. The weather has been very unsettled lately, resulting in inches upon inches of rain and intense thunder and lightening. Not usually one to get skittish, even during storms, Jack was super nervous. For the first time ever, he was allowed to sleep in our bed (he's not exactly a lap dog). Mario wasn't home and he wouldn't stop pacing, so he got to snooze with me. His bottom canine tooth allows sticks out like that. He's a funny boy. This ruggedly handsome fella is boarding a plane from St. Louis as we speak... and has a whole week before his next business trip. Also, our local weatherman claims there will be no more of this. However mean your life is, meet it and live it.